“Shallow understanding from people of good will is more frustrating than absolute misunderstanding from people of ill will.” wrote Charles M. Blow in a NY Times article titled “Activists ‘Feel the Bern’?”, referring to some liberals’ responses to Black Lives Matter interrupting two Bernie Sanders rallies . I consider the depth (or shallowness?) of my good will. I try to see the puzzle pieces that exist, and put them together, so I can understand myself and the situation better. I don’t want to be that person who is “more devoted to ‘order’ than to justice.” That said, I have a deep desire for both. I’m aware of my objective privilege and my subjective experience of not-exactly-privilege. Fragments of things that make sense inside paradox pierce the darkness. I stand in the midst of my general anxiety about the state of so many things — racism (institutional and individual), sexism (from mild all the way to human trafficking and sexual slavery), global warming, cruelty to & slaughter of billions of animals by our species, outlandish amounts of student debt in America, the American right. ISIS in particular, fundamentalism in general. Oh, and, did I mention, as a human, my own little personal challenges that simply being alive generates? Why oh why did I ever wonder why I have insomnia? By “virtue” of my white skin, I have the privilege of Not being racially profiled by employers, Not being subjected to “de facto” segregation, Not attending sub-standard, under-funded schools. Not having the epi-genetics of ancestors who were relentlessly abused for centuries. Not being feared by the “average citizen” just because I am a-black man-walking-down-the-street. I haven’t had to fear the Ku Klux Klan, or other well-armed white supremacist militia groups (though as a Jew I do fear them). I haven’t had to fear the police (except when I demonstrated against the Vietnam war and police batons swung terrifyingly near my head as they snapped my picket sign in two. Other protestors weren’t so lucky). Generally-speaking, it may look like we’re all swimming in the same American river, equal access to the river and all that. But, in fact, we, white people, are swimming downstream, the current (of white skin privilege) aiding our forward movement by simply not blocking it. It doesn’t feel like anything. We think it’s just the way it is, that somehow we were born better swimmers. We weren’t. Swimming downstream is easier. Black people are swimming against the current, upstream. Upstream means all kinds of institutional and individual racism on a daily basis — huge boulders of obstacality, sometimes merely blocking the way, like bad schools and high prices in poor communities, sometimes striking them, like a police club or bullet. Not to mention Gaslighting. “What’s the problem? After all we have a black President. Racism is over”. Not!!! I can’t imagine how exhausting, how anger-inducing un-ending centuries of racism must feel. john a. powell, Director of the Haas Institute for a Fair and Inclusive Society at UC Berkeley, where he is a Professor of Law, African American, and Ethnic Studies, wrote “…racial inequality is a documented fact. The reality of police killing of unarmed blacks, on-going economic inequality between whites and non-whites, vitriolic and personal attacks on President Obama, or even the extreme reaction to a Cheerio commercial featuring a biracial family—all these make it clear that we are not “over” race”. I first became aware I’d internalized racism when I was ten. There was an incident. Out of the blue one afternoon, my two-year old sister, pointing at her arm, asked our black maid, Dorothy, “why is your skin a different color than mine?” It was an innocent question. But my ten-year old self didn’t think so. I shushed her, then sputtered, a mortified-big-sister scold, “Terri, we don’t talk like that.” I was worried that her words had hurt Dorothy’s feelings by pointing out her skin color. My intention was good, but it was already bathed in racially-biased consciousness that brown was inferior to white. I was uncomfortable not only with Terri’s question; I was uncomfortable with my response. I can still feel that moment’s mix of embarrassment, shame, and confusion. 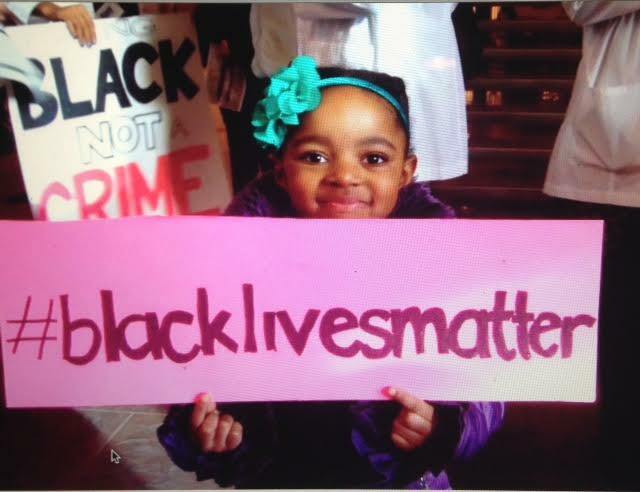 When Black Lives Matter (BLM) first appeared, I thought, Yes! And… All Lives Matter. All lives do matter. But that’s not the point. After hundreds of years of slavery and another 150 years of formal then informal Jim Crow, ending racism in this country is centuries overdue. Centuries overdue! Stating clearly, emphatically Black Lives Matter has to do with the particularity of the oppression of black lives. Its on-going-ness. Its pervasiveness. Its obscene level of cruelty, passing for…business as usual. We will ALL be much better off for having the conversation. In March, 1960, Julian Bond helped draft an article called “An Appeal for Human Rights”. “Today’s youth will not sit by submissively while being denied all the rights and privileges and joys of life” it read. Segregation, it concluded, was “robbing not only the segregated but the segregator of his human dignity.” All still true today. I also identified with the frustration and determination of the BLM to be heard. For several days now, I’ve been contemplating this powerful and resonant article written by Gyasi Ross of the Blackfeet Nation. Agreeing with most of it; wrapping my mind around bits that didn’t sit well. Since I’m not always in accord with myself, this internal dialogue is not as easy as one might think, but it’s my starting place. The other day I was at the Prosthetic and Orthotic place getting my leg brace adjusted. My orthotist was telling me about his daughter’s imminent departure for college. He and his wife were trying to understand her pre-college behavior, her self-preoccupation and seeming disinterest in any communication with her parents. Her apparent lack of empathy towards them. His wife texted him this article (by Kira M. Newman), at work. He mentioned it to me. Sent me the link to read while I waited for him to work on my brace. The gist? When we’re anxious, we get stressed and when we’re stressed, we lose our empathy for the perceived other (parent, child, boss, employee, driver, racial group, etc). I thought about the audience at the Bernie Sanders rallies who had waited hours to hear him. I imagine they became anxious, then stressed, as the takeover unfolded. Which led them to lose their empathy. Which led some of them to booing and shouting negative things at people, whose cause, I believe, they would have otherwise been supportive of. I thought of the black women who seized the stage and microphone. How exhausting swimming upstream one’s entire life must be. How much anxiety and stress this must incur. How this caused a lack of empathy for Bernie Sanders and his audience. Understanding that anxiety induces stress, and stress reduces empathy, clarifies for me what happened. I don’t fully understand BLM’s strategy. On the one hand, it seems unnecessarily antagonistic toward a pretty friendly ally. On the other hand, maybe seizing the stage was theatrical genius? Maybe it was the only way they saw to bring attention to the issue, bring the issue to the news? Put America on notice. Naturally, we humans don’t all agree on the path to achieve goals we may hold in common. Civil rights. Human rights. Peaceful co-existence. Mutual respect. Safety. Happiness. Not agreeing on the path is not pathology; it’s how we humans roll. In my experience, we (humans, that is) are not that good at talking about things we disagree on, whether it’s goals, strategies, or tactics. Generally-speaking, we don’t listen well to each other. We make assumptions. We take things personally. Respect and empathy go out the window pretty quickly. Some have more privilege than others in a variety of ways. We All have our sensitivities, often hard-earned, and, just as often, unconscious, which, when triggered, often produce reactivity. Ok, it’s really hard not to be reactive, but that just means we have our work cut out for us, to notice our own fear and reactivity, and to help bring respect and kindness into the dialogue. I don’t want to mis-take “civility” for a solution in and of itself. When civilized words and promises of those who hold power are empty, “civility” means nothing. When the first communication from those policing a black community is violence (disrespectful language, physical force, bullets), why would we expect the community to respond with civility? Still, there is precedence for non-violent action. There is non-violent civil disobedience practiced by Ghandi in India, and by Martin Luther King, Jr., James Lewis, and other leaders of the civil rights movement here. Both movements were powerful and successful. Important changes were wrought. The list of grudge-holding, violence-wielding parties in conflicts around the world (individuals and nations) is daunting. We have to find better ways to make change. To dialogue. To problem-solve. Forsake militarism.There are wise people in the world teaching with words and action. Thank you Charles M. Blow, john a. powell, Gyasi Ross, Jose Antonio Vargas, Julian Bond, Kira M. Newman, Kelly Wickham, Alice Walker, HH Dalai Lama, and so many more who have started the conversation. Thank you all, dear friends who Want this conversation. And “my friends the enemy” who have their work too, who, perhaps, are the pirate in Thich Nhat Hanh’s poem, “Call Me By My True Names” “[his] …heart … not yet capable of seeing and loving”. In certain moments we are all the pirate. Me too, Mahatmaji. Me too. Oh, I so appreciate your deep thought process in all it’s complexity and nuance in this entry. And the concept of “stress reduces empathy” can be applied to so many situations of conflict in life and indeed, the human condition. Side note: heard Melissa Harris-Perry on MSNBC last night respond to the question, “Why does BLM show up at Bernie Sanders’ rallies and not the others?” “Because he is the one who really wants and needs the Black vote.” Makes sense. Thank you for helping me to further clarify my thoughts and bring light to this difficult and painful process of looking within, reacting and responding. Thanks Lisa. The “stress reduces empathy” thing was new to me, and I agree, it’s an excellent framework through which to understand a lot of things better, and take them less personally. I hope I can remember it the next time I witness someone lacking empathy toward me or another, and the next time I lack it myself. To take a step or two back and see where my stress and anxiety is coming from. To maybe show myself a little extra kindness. I remember once approaching a well known Native Ametican basket weaver in Yosemite at the Museum. My feelings were hurt when it was clear to me that she didn’t see me as a sympathetic ally but as the “other”. Even though, I didn’t like it, I had to acknowledge to myself that her feelings were sincere and based on trauma. It was tough to realize that I didn’t have the right to her approval. Ah, Sara, I so know what you mean. It’s hard for any, every, one to be judged by the color of their skin, ethnicity, nationality or whatever. It’s great when we can have empathy for the “other’s” suffering, so we don’t have to take their dis-interest or worse, their judgement personally. It’s sad that we human have such a rough time trusting/caring for the other. Evolutionarily speaking, if probably helped we humans who are here to survive, but it was always at a cost, and we’re still paying it. Again, loving your thoughts, strength clarity and questions. Swimming up and downstream metaphor a good one! Did u hear Hillary conversation with BLM folks? Firm voice that we won’t change all the hearts; we can change laws and systems and we must have plans–interesting.